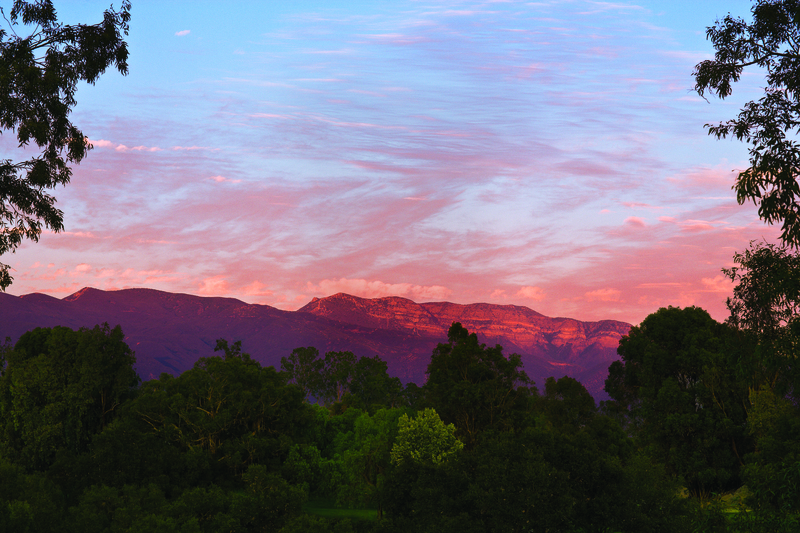 We all hush at the magical “Pink Moment” when the sky to the east over the Topa Topa Mountains creates brilliant shades of pink as the sun sets in Ojai, California. This is one of the few places in the world where people can see this phenomenon due to the east-west orientation of the mountains. Ojai is about 30 miles southeast of Santa Barbara or 90 miles north of LAX. Ojai is one of my favorite places for a short stay with the family. We love the historic Spanish Colonial Ojai Valley Inn and Spa where I find the relaxing, casually elegant ambience evokes immediate relaxation. I can be perfectly content just soaking up the resort’s beautiful grounds, gardens and golf course, but we also enjoy the wide variety of activities for both adults and children on site, and in the town of Ojai. The Inn is pet-friendly and we enjoyed being able to take our dog with us. I love the Mind and Body Studio located in the Spa Ojai building where they offer many different classes throughout the day, such as Pilates, several types of yoga, water exercise in the spa’s pool, stretching, cardio, spinning, Qi Gong, sometimes dance, and others. The Inn also offers classes for the mind such as meditation, physical wellness, and art classes at the Artist Cottage and Apothecary. The resort has a premier championship golf course, with excellent professional lessons and a sports psychologist to help with the important mental part of your skills. Upon arrival, staff take your golf clubs to the clubhouse where they clean your golf shoes and ready your clubs for your scheduled round of golf. Because it is such a popular course, reservations are recommended. The Inn’s storied tennis history dates back to the late 19th century and boasts being one of the top tennis facilities in a hotel or resort in the United States. Professional tennis instruction is available. There are myriad activities that can be done alone, as a couple or a family including hiking, biking, basketball, fishing, softball, volleyball and tennis. Camp Oak offers creative, stimulating and fun themed half-day and full-day activities for five to twelve year-olds. From 8 to 9 a.m., Acorn Hour at Camp Ojai hosts bonding for parents and their two to four year-old children by doing crafts or storytelling. During the summer, there are complimentary movies to watch while floating in the main pool. Free popcorn is also provided. The resort will arrange for horseback rides nearby that are suitable for the ages and skills of the riders; we have had fantastic experiences doing this. A walk into downtown Ojai offers an opportunity to explore the inviting historic downtown area. Make sure to check out Bart’s Books, which is the largest independently-owned outdoor bookstore in the U.S. In town, we like to have dinner at Azu, where they have Spanish- and Mediterranean-inspired comfort food. They have many tapas style small dishes, as well as creative, tasty entrees. `The Ranch House requires a short but worthwhile drive for gourmet award-winning cuisine in a romantic atmosphere that has streams and lush plants. 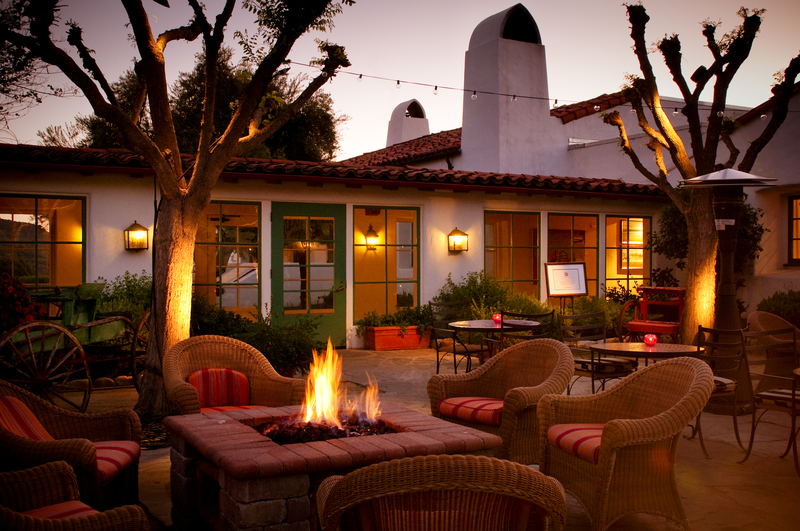 There are several great spots to eat at the Ojai Valley Inn. The Oak Grill offers outdoor and indoor dining with the best Cobb salad I have ever had. Jimmy’s Pub is a good, casual après golf place for snacks, burgers, and drinks. More health conscious cuisine is available at the Spa’s restaurant, Café Verde. Maravilla is the Inn’s signature restaurant where they serve excellent, seasonally-inspired cuisine with locally-sourced produce featuring steaks, chops and seafood. The wine selection is excellent and the restaurant’s ambience is warm and inviting. Whenever we have been there on a week-end, in the evenings we have enjoyed entertaining live jazz in the lounge just in front of Maravilla while sitting near the warmth of the fireplace.